In trend terms Australian unemployment increased to 6.28% from 6.27% in December, a minuscule rise but still the highest level seen since July 2002. From a year earlier the rate has increase by 0.4ppts. Over the month full time employment grew by 6,246 while part time workers increased 8,952. Still, despite an 15,198 increase in employment, the size of the labour market swelled by 18,789. As a consequence total unemployment increased by an additional 3,592 persons. 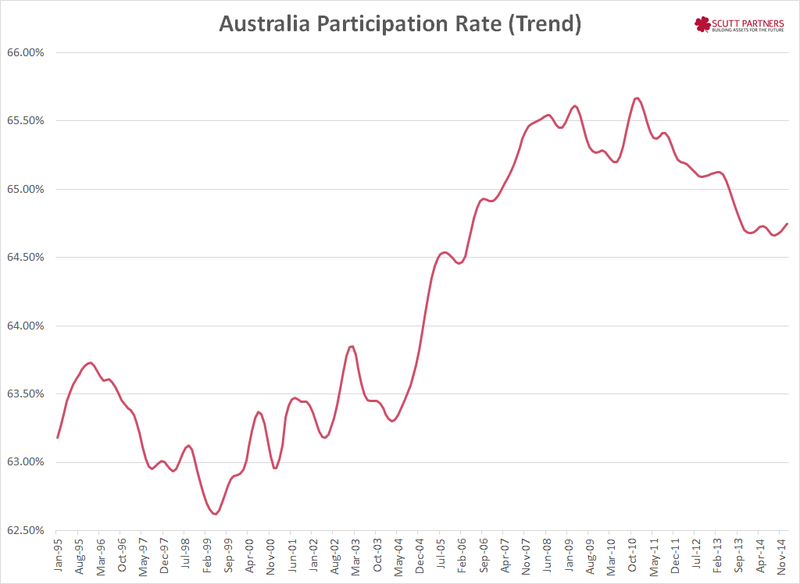 This is a familiar trend within Australia in recent years. Yes, jobs are being created, but not at a pace required to keep up with supply. Total labour market participation rose to 64.75%, the fourth-consecutive monthly increase and the highest level since September 2013. The total employment to population ratio also increased to 60.68%, the highest level seen since August 2014. Over the past 12 months total aggregate hours worked grew by just 0.33%. Those for full time workers dropped 0.16% while part time hours increased by 3.0%. Over the past 12 months employment growth came in at 1.414%. 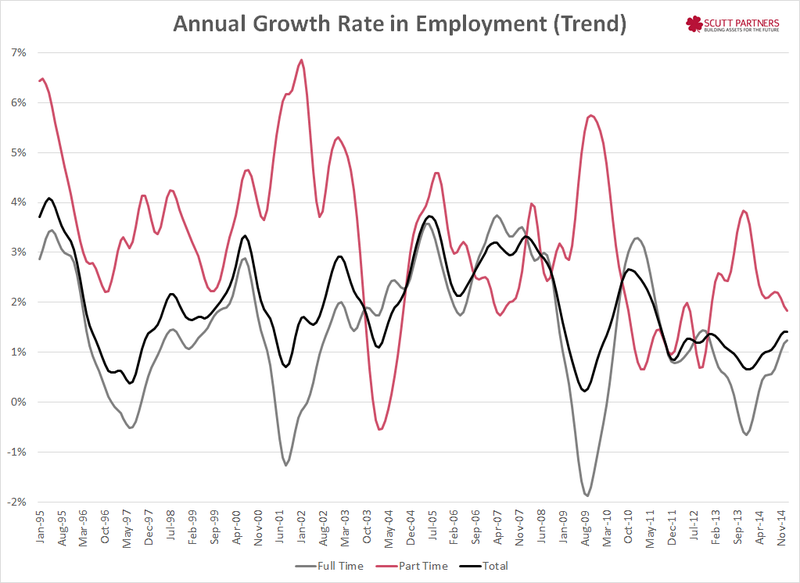 Part time employment grew by 1.833%, well down on the 3.5%+ growth seen 12 months earlier, while full time employment growth improved to 1.229% having been negative a year earlier. The reason for the continued lift in unemployment is that job creation is simply not keeping pace with the increase in the size of the labour force. Over the past year employment growth came in at 1.414%, below that of the labour force which grew by an additional 1.849%. As a consequence total unemployment grew by 8.8% on year. In numeric terms employment rose by 162,659, the labour force 225,936 and unemployment 63,277 over the past 12 months. For the month Victoria recorded the strongest employment growth at 7,365. The only State or Territory to record a decline was South Australia at 788. Aside from the ACT which recorded a decline of 1,004 all States and Territories saw employment increase in the past 12 months. Victoria was once again the stand out registering a net increase of 65,620. South Australia has the highest unemployment rate around the nation at 6.9%, the Northern Territory the lowest at 3.7%. Youth unemployment rose to 13.96%, the highest level seen since October 1998. Total youth employment over the past 12 months increased 0.2% while the labour force expanded by a much larger 1.98%. With more entering the workforce than jobs being created youth unemployment is now 14.7% higher than 12 months ago. The last time an acceleration of this magnitude occurred was during the global financial crisis. Very little in terms of the outlook for monetary policy. As the RBA forecast in their recent statement on monetary policy they expect unemployment to peak a little higher, and remain there are little longer, than what they previously expected. At this point in the labour market cycle there simply not enough jobs being created to keep pace with working-age population increase. While forward-looking labour market indicators are improving it appears, at least for the moment, that they will need to strengthen further to bring down the unemployment rate. In order to do this the RBA will look to stimulate the economy further by cutting interest rates 25bps in the months ahead. From there I suspect they’ll wait to see what actions the Federal Reserve take before adding to stimulus, or dropping their easing bias, in the second half of the year.